Race planning from the team came to the fore on Saturday with Barthelona proving too good in the ATA Celebrates Women Trainers Handicap (1400m). Barthelona has been carrying big weights and Mike Moroney opted to lessen that by going up in class and using apprentice Lachlan King to claim. Crossing from a wide draw, King settled Barthelona in second place early on the outside of Dantga and then challenged for the lead around the home turn. Barthelona struck the front 400m out and stayed on gamely to defeat Miles Of Krishan and Mantastic, which dead-heated for second, by half a length. Moroney said he felt King’s claim made all the difference. 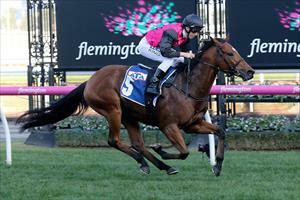 “He’s not a horse that carries a lot of weight and I thought the claim was key,” Moroney said. “He ended up only just above the minimum so we thought he was well placed. It was the second consecutive meeting at Flemington where Lachlan King has ridden a winner and Moroney said the apprentice had been rewarded for helping out riding work at Flemington. “He’s a nice lad and clearly a good rider,” Moroney said. “He’s been coming in a couple of mornings to ride work so it’s nice to get a winner with him. "I also want to acknowledge Kosi Kawakami who rides the horse in his work - he's not the easiest on the track but Kosi has done a great job with him." It is the fifth win for Barthelona, a four-year-old son of Zoffany and purchased as a yearling by Paul Moroney for $50,000 with earnings now $198,120. Congratulations to Mr G J P Van Ameyden, Mr P J Brown, Mr D J McKee, Mr T R Askew, Mr M G Askew, Mr P J Reeves, Mr O M Jackson, Ms S J Nuttall, Mr G J Sharp, Mr N Collinson, Mrs Y Collinson, Mr A Sharp, Mr D H Mikhail and Mr B L Page.